A devil-worship covern leader searches for a book that will free his followers. This 1975 film, which also features Alien’s Tom Skerritt and John Travolta in his first movie role, concerns a coven led by Satanist Jonathan Corbis (Borgnine, surprisingly good), the reincarnation of a 17th century witch. He is attempting to retrieve a long-lost book kept hidden for centuries by members of the Preston family, so that he can free the souls of his followers, who are trapped in limbo. It’s an unconvincing yarn, given energy by director Robert Fuest (director of the Doctor Phibes movies and some of the best episodes of The Avengers). The film is enlivened by some decent performances, and boasts some very nice make-up work. 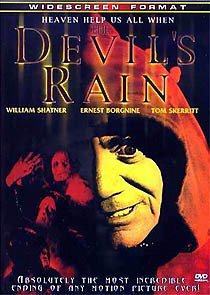 The Devil’s Rain is presented in letterboxed format, in a ratio of about 2.35:1. There’s a tendency for splice marks to appear on cuts, however, so it obviously isn’t framed correctly. Nor is it 16:9 enhanced. The film has strong colours, and is generally stable. There’s a lot of hiss and crackle to contend with, and the print has minor dirt speckles throughout, but the widescreen image makes this a vast improvement on previous transfers. If you’ve not seen The Devil’s Rain, and have managed to avoid the tantalising photo’s that graced several key publications of the 70s and 80s, you’re still likely to have the film’s memorable finale spoiled by the disc’s packaging and menu screens on this disc. Likewise, avoid the theatrical trailer on the disc until you’ve seen the film.